We encourage you to follow up on our new products. Modern technology and safety of the patients are our top priority. Granulox® is a hemoglobin spray to support the healing of chronic wounds. 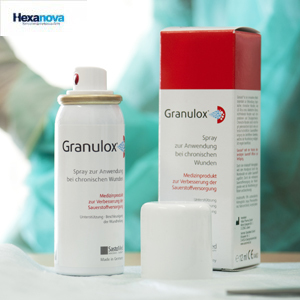 Granulox® is the first dressing with hemoglobin to significantly improve oxygen supply to wounds with poor blood supply and thereby decisively accelerate wound healing. Granudacyn ® is a wound irrigation solution for cleaning, moistening and rinsing of acute, chronic and contaminated wounds and 1st and 2nd-degree burns. 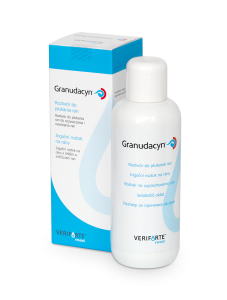 Granudacyn ® cleans the wound by mechanical removal of microorganisms and prevents the growth of bacteria, viruses, spores and fungi. 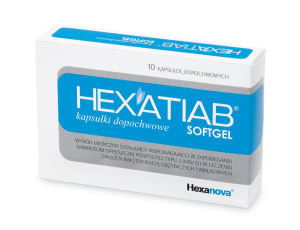 HEXATIAB® vaginal capsules SOFTGEL is a medical product. Its main component is a patented Tiab molecule containing silver ion (complex of titanium dioxide nanoparticles covalently linked to an active silver). HEXATIAB® vaginal capsules SOFTGEL have a strong protective properties, preventing the development and recurrence of bacterial, fungal and viral infections, including HSV-2.